Watch what the Barton Black-grass Focus Site has in store for this season, with new research and innovative trials. Click on the link below to watch. See what’s new on the UKs most comprehensive multi-year, integrated black-grass control trials site. Now into third year of a dynamic layered approach to cultivations/establishment systems/crop/variety and herbicide trials, the Barton Black-grass Focus Site, near Cambridge, has a host of new ideas for the coming season. 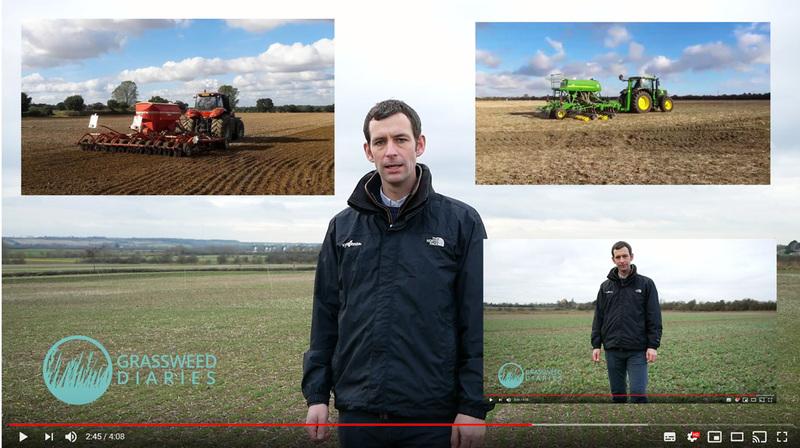 Syngenta Field Technical Manager, James Southgate, highlighted that grass weed seed dormancy was exceptionally low after harvest, which has offered a real chance to take great advantage of cultural controls. How do cover crops influence Black-grass populations and control? “With several years of results at Barton we are building up a really good picture of techniques that growers could look at for their farms; the control that can be achieved and, crucially, the financial implications for the current crop and longer term sustainable grass weed control. Furthermore, with three years of application trials on the site – which inspired the Low; Slow; Covered approach to pre-em techniques – further exciting work is looking at new nozzle options and techniques to cope with gusty conditions.